A WEST Yorkshire industrial estate is now fully let following a deal which saw a frame manufacturer sign for an 81,656 sq ft facility which will become its main production base. 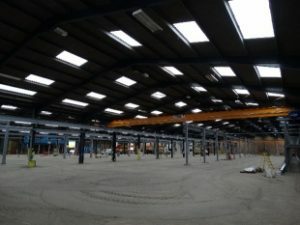 PAW (Holdings), trading as Sigmat Light Gauge Steel Framing, has signed a 15-year lease at Cross-site at Cross Green Industrial Estate in Leeds. Sigmat specialise in the design, manufacture and assembly of pre panelised steel frames and light structures. The deal of more than £3 per sq ft follows significant refurbishment by On-site Property Solutions which acquired the site a year ago. Cranes and offices are currently being installed by Sigmat which will see the facility fully operational by September 2016. The remaining 30,000 sq ft are leased on similar terms to Lawcris Panel Products Limited, the former owner. On-site is an associated company of In-site Property Solutions, an industrial property company based at Bramham. Langleys Solicitors and commercial property consultant Holder & Co acted for On-site on the purchase of Cross-site. Holder & Co also acted on the subsequent letting to PAW (Holdings). Owen Holder, of Holder & Co, added: “On-site has done a fabulous job identifying this opportunity, adding value in the works they have undertaken and in increasing the size of the yard area. Ultimately they have added significant value to the investment.